As of January 31, 2017, the last business day of the registrant’s most recently completed second fiscal quarter, the aggregate market value of voting and non-voting common stock held by non-affiliates of the registrant was $5,521,028,309 (based on the closing price of $41.91 as reported on the New York Stock Exchange as of that date). As of September 20, 2017, there were approximately 129,904,887 shares of the registrant’s common stock outstanding. Portions of the registrant’s Proxy Statement for its 2017 annual meeting of stockholders (the “2017 Proxy Statement”) are incorporated by reference in Part III, as specifically set forth in Part III. Donaldson Company, Inc. (Donaldson or the Company) was founded in 1915 and organized in its present corporate form under the laws of the State of Delaware in 1936. The Company is a worldwide manufacturer of filtration systems and replacement parts. The Company’s core strengths are leading filtration technology, strong customer relationships and its global presence. Products are manufactured at 44 plants around the world and through three joint ventures. The Company has two reporting segments: Engine Products and Industrial Products. Products in the Engine Products segment consist of replacement filters for both air and liquid filtration applications, air filtration systems, liquid filtration systems for fuel, lube and hydraulic applications, and exhaust and emissions systems. The Engine Products segment sells to original equipment manufacturers (OEMs) in the construction, mining, agriculture, aerospace, defense and truck end markets and to independent distributors, OEM dealer networks, private label accounts and large equipment fleets. Products in the Industrial Products segment consist of dust, fume and mist collectors, compressed air purification systems, air filtration systems for gas turbines, polytetrafluoroethylene (PTFE) membrane-based products and specialized air and gas filtration systems for applications including hard disk drives and semi-conductor manufacturing. The Industrial Products segment sells to various dealers, distributors, OEMs of gas-fired turbines and OEMs and end users requiring clean filtration solutions and replacement filters. The discussion below should be read in conjunction with the risk factors discussed in Part I, Item 1A, “Risk Factors” in this Annual Report on Form 10-K (Annual Report). Total net sales contributed by the principal classes of similar products and financial information about segment operations and geographic regions appear in Note 18 in the Notes to Consolidated Financial Statements included in Item 8 of this Annual Report. The Company makes its annual reports on Form 10-K, quarterly reports on Form 10-Q, current reports on Form 8-K, proxy statements and other information (including amendments to those reports) available free of charge through its website at ir.donaldson.com, as soon as reasonably practicable after it electronically files such material with (or furnishes such material to) the Securities and Exchange Commission. Also available on the Company’s website are corporate governance documents, including the Company’s Code of Business Conduct and Ethics, Corporate Governance Guidelines, Audit Committee charter, Human Resources Committee charter and Corporate Governance Committee charter. These documents are also available in print, free of charge, to any person who requests them in writing to the attention of Investor Relations, MS 102, Donaldson Company, Inc., 1400 West 94th Street, Bloomington, Minnesota 55431. The information contained on the Company’s website is not incorporated by reference into this Annual Report and should not be considered to be part of this report. A number of the Company’s end markets are dependent on the construction, agricultural and power generation industries, which are generally stronger in the second half of the Company’s fiscal year. The first two quarters of the fiscal year also contain the traditional summer and winter holiday periods, which are typically characterized by more customer plant closures. Principal methods of competition in both the Engine and Industrial Products segments are technology, innovation, price, geographic coverage, service and product performance. The Company competes in a number of highly competitive filtration markets in both segments. The Company believes it is a market leader within many of its product lines, specifically within its Off-Road and On-Road product lines for OEMs, and has a significant business in the aftermarket for replacement filters. The Engine Products segment’s principal competitors include several large global competitors and many regional competitors, especially in the Aftermarket business. The Industrial Products segment’s principal competitors vary from country to country and include several large regional and global competitors and a significant number of smaller competitors who compete in a specific geographical region or in a limited number of product applications. The principal raw materials that the Company uses are steel, filter media and petrochemical based products including plastics, rubber and adhesives. Purchased raw materials represent approximately 60% to 65% of the Company’s cost of goods sold. Steel, including fabricated parts, and filter media each represent approximately 20%. The remainder is primarily made up of petroleum-based products and other raw material components. The cost the Company paid for steel during fiscal 2017 varied by grade, but in aggregate, increased during the fiscal year. The steel cost increase was related to import restrictions placed on foreign-made steel and on a post-election run-up in steel in U.S. markets and on upward price pressure in other geographies around the world. The Company’s cost of filter media also varies by type and increased slightly year-over-year. The Company operates ongoing continuous improvement efforts, which partially offset increases in both steel and filter media. The cost of petroleum-based products was relatively flat year-over-year. The Company anticipates some continuing pressure on commodity prices in fiscal 2018, as compared with fiscal 2017, specifically for steel and filter media. On an ongoing basis, the Company enters into selective supply arrangements with certain of its suppliers that allow the Company to reduce volatility in its costs. The Company strives to recover or offset all material cost increases through selective price increases to its customers and the Company’s cost reduction initiatives, which include material substitution, process improvement and product redesigns. The Company owns various patents and trademarks, which it considers in the aggregate to constitute a valuable asset, including patents and trademarks for products sold under the Ultra-Web®, PowerCore® and Donaldson® trademarks. The Company had no customers that accounted for over 10% of net sales in the years ended July 31, 2017, 2016 or 2015. The Company had no customers that accounted for over 10% of gross accounts receivable at July 31, 2017 or July 31, 2016. At August 31, 2017, the backlog of orders expected to be delivered within 90 days was $395.5 million. The 90-day backlog at August 31, 2016, was $323.0 million. The increase is due to the continued strong demand across multiple product lines. Backlog is one of many indicators of business conditions in the Company’s markets. However, it is not always indicative of future results for a number of reasons, including short lead times in the Company’s replacement parts businesses and the timing of orders in many of the Company’s engine OEM and industrial markets. During the years ended July 31, 2017, 2016 and 2015, the Company spent $54.7 million, $55.5 million and $60.2 million, respectively, on research and development activities, which was 2.3%, 2.5% and 2.5% of net sales, respectively. Research and development expenses include basic scientific research and the application of scientific advances to the development of new and improved products and their uses. Substantially all commercial research and development is performed in-house. The Company does not anticipate any material effect on its capital expenditures, earnings or competitive position during fiscal 2018 due to compliance with government regulations regulating the discharge of materials into the environment or otherwise relating to the protection of the environment. The Company employed approximately 13,200 people in its worldwide operations as of July 31, 2017. Both of the Company's segments serve customers in all geographic regions worldwide. The United States represents the largest current individual market for the Company's products. Germany is the single largest market outside the United States. Financial information by geographic areas appears in Note 18 in the Notes to Consolidated Financial Statements included in Item 8 of this Annual Report. There are inherent risks and uncertainties associated with our global operations that involve the manufacturing and sale of products for highly demanding customer applications throughout the world. These risks and uncertainties could adversely affect our operating performance and financial condition. The following discussion, along with discussions elsewhere in this report, outlines the risks and uncertainties that we believe are the most material to our business at this time. We undertake no obligation to publicly update or revise any forward-looking statements, whether as a result of new information, future events, or otherwise, unless required by law. Economic Environment - the demand for our products relies on economic and industrial conditions worldwide. Changes in economic or industrial conditions could impact our results or financial condition in any particular period as our business can be sensitive to varying conditions in all major geographies and markets. Products - maintaining a competitive advantage requires continuing investment with uncertain returns. We operate in highly competitive markets and have numerous competitors that may already be well-established in those markets. We expect our competitors to continue improving the design and performance of their products and to introduce new products that could be competitive in both price and performance. We believe that we have certain technological advantages over our competitors, but maintaining these advantages requires us to continually invest in research and development, sales and marketing and customer service and support. There is no guarantee that we will be successful in maintaining these advantages. We make investments in new technologies that address increased performance and regulatory requirements around the globe. There is no guarantee that we will be successful in completing development or achieving sales of these products or that the margins on such products will be acceptable. Our financial performance may be negatively impacted if a competitor’s successful product innovation reaches the market before ours or gains broader market acceptance. In addition, we may be adversely impacted by changes in technology that could reduce or eliminate the demand for our products. These risks include wider adoption of technologies providing alternatives to diesel engines. Competition - we participate in highly competitive markets with pricing pressure. The businesses and product lines in which we participate are very competitive and we risk losing business based on a wide range of factors, including price, technology, geographic coverage, product performance and customer service. Our customers continue to seek productivity gains and lower prices from us and their other suppliers. If we are not able to compete effectively, our margins and results of operations could be adversely affected. Intellectual Property - demand for our products may be affected by new entrants that copy our products and/or infringe on our intellectual property. The ability to protect and enforce intellectual property rights varies across jurisdictions. An inability to preserve our intellectual property rights may adversely affect our financial performance. Competitors and others may also initiate litigation to challenge the validity of our intellectual property or allege that we infringe their intellectual property. We may be required to pay substantial damages if it is determined our products infringe on their intellectual property. We may also be required to develop an alternative, non-infringing product that could be costly and time-consuming, or acquire a license on terms that are not favorable to us. Protecting or defending against such claims could significantly increase our costs, divert management’s time and attention away from other business matters and otherwise adversely affect our results of operations and financial condition. Global Operations - operating globally carries risks that could negatively affect our financial performance. local economic, political and social conditions, including in the Middle East, Ukraine, China, Thailand, South Korea and other emerging markets where we do business. Due to the international scope of our operations, we are subject to a complex system of import- and export-related laws and regulations. Any alleged or actual violations may subject us to government scrutiny, investigation and civil and criminal penalties, and may limit our ability to import or export our products or to provide services outside the United States (U.S.). The enforcement of bribery, corruption and trade laws and regulations is increasing in frequency and complexity on a global basis. The continued geographic expansion of our business increases our exposure to, and cost of complying with, these laws and regulations. If our compliance programs do not adequately prevent or deter our employees, agents, distributors, suppliers and other third parties with whom we do business from violating anti-corruption laws, we may incur defense costs, fines, penalties, reputational damage and business disruptions. Customer Concentration - a number of our customers operate in similar cyclical industries. Economic conditions in these industries could have a negative impact on our financial performance. No customer accounted for ten percent or more of our net sales in fiscal 2017, 2016 or 2015. However, a number of our customers are concentrated in similar cyclical industries (construction, agriculture and mining), resulting in additional risk based on industrial conditions in those sectors. A decline in the economic conditions of these industries could result in reduced demand for our products and difficulty in collecting amounts due from our customers. Supply Chain - unavailable or higher cost materials could impact our financial performance. We obtain raw materials, including steel, filter media, petroleum-based products and other components, from third-party suppliers and tend to carry limited raw material inventories. An unanticipated delay in delivery by our suppliers could result in the inability to deliver on-time and meet the expectations of our customers. An increase in commodity prices could also result in lower operating margins. Technology Investments and Security Risks - difficulties with our information technology systems and security could adversely affect our results. We have many information technology systems that are important to the operation of our business, some of which are managed by third parties. These systems are used to process, transmit and store electronic information and to manage or support a variety of business processes and activities. We could encounter difficulties in developing new systems, maintaining and upgrading our existing systems and preventing information security breaches. Such difficulties could lead to significant additional expenses and/or disruption in business operations that could adversely affect our results. Additionally, information technology security threats are increasing in frequency and sophistication. These threats pose a risk to the security of our systems and networks and the confidentiality, availability and integrity of our data. Should such an attack succeed, it could lead to the compromising of confidential information, manipulation and destruction of data, defective products, production downtimes and operations disruptions. The occurrence of any of these events could adversely affect our reputation and could result in litigation, regulatory action, potential liability and increased costs and operational consequences of implementing further data protection matters. Currency - an unfavorable fluctuation in foreign currency exchange rates could adversely impact our results of operations. We have operations in many countries, with more than one-half of our annual revenue coming from countries outside of the U.S. Each of our subsidiaries reports its results of operations and financial position in its relevant functional currency, which is then translated into U.S. dollars. This translated financial information is included in our consolidated financial statements. Strengthening of the U.S. dollar in comparison to the foreign currencies of our subsidiaries has a negative impact on our results and financial position. In addition, decreased value of local currency may make it difficult for some of our customers, distributors and end users to purchase our products. Legal and Regulatory - costs associated with lawsuits, investigations or complying with laws and regulations may have an adverse effect on our results of operations. in which we operate, including those governing emissions to air; discharges to water; and the generation, handling, storage, transportation, treatment and disposal of waste materials. It is not possible to predict the outcome of investigations and lawsuits, and we could incur judgments, fines, or penalties or enter into settlements of lawsuits and claims that could have an adverse effect on our business, results of operations and financial condition in any particular period. In addition, we may not be able to maintain our insurance at a reasonable cost or in sufficient amounts to protect us against any losses. Income Tax - changes in our effective tax rate could adversely impact our net income. We are subject to income taxes in various jurisdictions in which we operate. Our tax liabilities are dependent upon the location of earnings among these different jurisdictions. Our provision for income taxes and cash tax liability could be adversely affected by numerous factors, including income before taxes being lower than anticipated in countries with lower statutory tax rates and higher than anticipated in countries with higher statutory tax rates, changes in the valuation of deferred tax assets and liabilities and changes in tax laws and regulations. We are also subject to the continuous examination of our income tax returns by tax authorities. The results of audits and examinations of previously filed tax returns and continuing assessments of our tax exposures may have an adverse effect on our provision for income taxes and cash tax liability. Personnel - our success may be affected if we are not able to attract, develop and retain qualified personnel. Our success depends in large part on our ability to identify, recruit, develop and retain qualified personnel worldwide. If we are unable to meet this challenge, it may be difficult for us to execute our strategic objectives and grow our business, which could adversely affect our results of operations and financial condition. Liquidity - changes in the capital and credit markets may negatively affect our ability to access financing. Disruption of the global financial and credit markets may have an effect on our long-term liquidity and financial condition. During fiscal 2017, credit in the global credit markets was accessible and market interest rates remained low. We believe that our current financial resources, together with cash generated by operations, are sufficient to continue financing our operations for the next twelve months. There can be no assurance, however, that the cost or availability of future borrowings will not be impacted by future capital market disruptions. Some of our existing borrowings contain covenants to maintain certain financial ratios that, under certain circumstances, could restrict our ability to incur additional indebtedness, make investments and other restricted payments, create liens and sell assets. As of July 31, 2017, the Company was in compliance with all such covenants. The majority of our cash and cash equivalents are held by our foreign subsidiaries as over half of our earnings occur outside the U.S. Most of these funds are considered permanently reinvested outside the U.S., as the cash generated from U.S. operations plus our debt facilities are anticipated to be sufficient for our U.S. operation’s cash needs. If additional cash is required for our operations in the U.S., it may be subject to additional U.S. taxes if funds are repatriated from certain foreign subsidiaries. Acquisitions - the execution of our acquisition strategy may not provide the desired return on investment. We have made and continue to pursue acquisitions, including our acquisitions of Industrias Partmo S.A. (Partmo) and Hy-Pro Corporation (Hy-Pro) in fiscal 2017, Engineered Products Company (EPC) in fiscal 2016 and Northern Technical L.L.C. (Northern Technical) and IFIL USA L.L.C. (IFIL USA) in fiscal 2015. These acquisitions could negatively impact our profitability due to operating and integration inefficiencies, the incurrence of debt, contingent liabilities and amortization expenses related to intangible assets. There are also a number of other risks involved in acquisitions, including the potential loss of key customers, difficulties in assimilating the acquired operations, the loss of key employees and the diversion of management’s time and attention away from other business matters. Impairment - if our operating units do not meet performance expectations, assets could be subject to impairment. Our total assets include goodwill from acquisitions. We test annually whether goodwill has been impaired, or more frequently if events or changes in circumstances indicate the goodwill may be impaired. If future operating performance at one or more of our operating units were to fall significantly below forecast levels or if market conditions for one or more of our acquired businesses were to decline, we could be required to incur a non-cash charge to operating income for impairment. Any impairment in the value of our goodwill would have an adverse non-cash impact on our results of operations and reduce our net worth. Restructuring - if we do not successfully execute our restructuring plans and realize the expected benefits, our financial performance may be adversely affected. From time to time we have initiated restructuring programs related to our business strategy to, among other things, reduce operating expenses and align manufacturing capacity to demand. We may not be able to realize the expected benefits and cost savings if we do not successfully execute these plans. If difficulties are encountered or such cost savings are otherwise not realized, it could adversely impact our results of operations. Internal Controls - if we fail to maintain an effective system of internal control over financial reporting, we may not be able to accurately report our financial results and prevent material fraud, which could adversely affect the value of our common stock. Failure to maintain an effective system of internal control over financial reporting resulted in a material weakness during fiscal 2015. Effective internal control over financial reporting is necessary for us to provide reliable financial reports and effectively prevent and detect material fraud. If we cannot provide reliable financial reports or prevent or detect material fraud, our operating results could be misstated. Failure to maintain an effective system of internal control over financial reporting resulted in a material weakness during fiscal 2015. Although we completed our remedial actions in response to this matter, there can be no assurances that we will be able to prevent future control deficiencies from occurring, which could cause us to incur unforeseen costs, negatively impact our results of operations, cause the market price of our common stock to decline or have other potential adverse consequences. The Company’s principal administrative office and research facilities are located in Bloomington, Minnesota. The Company’s principal European administrative and engineering offices are located in Leuven, Belgium. The Company also has extensive operations in the Asia Pacific and Latin America regions. The Company’s principal manufacturing and distribution activities are located throughout the world. The following is a summary of the principal plants and physical properties owned or leased by the Company as of July 31, 2017.
in leased facilities. The Company uses third-party logistics providers for some of its product distribution and neither leases nor owns the related facilities. The Company considers its properties to be suitable for their present purposes, well-maintained and in good operating condition. The Company believes the recorded estimated liability in its Consolidated Financial Statements for claims or litigation is adequate in light of the probable and estimable outcomes. Any recorded liabilities were not material to the Company’s financial position, results of operations or liquidity and the Company believes it is remote that the settlement of any of the currently identified claims or litigation will be materially in excess of what is accrued. The Company records provisions when it is probable that a liability has been incurred and the amount of the loss can be reasonably estimated. Claims and litigation are reviewed quarterly and provisions are taken or adjusted to reflect the status of a particular matter. Current information as of August 31, 2017, regarding executive officers is presented below. All officers hold office until their successors are elected and qualify, or their earlier death, resignation or removal. There are no arrangements or understandings between individual officers and any other person pursuant to which the officer was selected as an executive officer. Ms. Becker joined the Company in 1998 as Senior Counsel and Assistant Corporate Secretary and was appointed to Vice President, General Counsel and Secretary in August 2014. Prior to joining the Company, Ms. Becker was an attorney for Dorsey and Whitney, LLP from 1991 to 1995 and was a Project Manager and Corporate Counsel for Harmon, Ltd. from 1995 to 1998. Mr. Carpenter joined the Company in 1996 and has held various positions, including Gas Turbine Systems General Manager from 2002 to 2004; General Manager, Industrial Filtration Systems Sales from 2004 to 2006; General Manager, Industrial Filtration Systems Americas in 2006; Vice President, Global Industrial Filtration Systems from 2006 to 2008; Vice President, Europe and Middle East from 2008 to 2011; and Senior Vice President, Engine Products from 2011 to 2014. In April 2014, Mr. Carpenter was appointed Chief Operating Officer. On April 1, 2015, Mr. Carpenter was appointed President and Chief Executive Officer. Ms. Kramer was appointed Vice President, Human Resources in October 2015. Prior to joining the Company, Ms. Kramer was Vice President, Human Resources for Taylor Corporation, a print and graphics media company, from 2013 until September 2015. From 1991 to 2013, Ms. Kramer was with Lifetouch, Inc., a photography company, where she held various human resources roles including Corporate Vice President, Human Resources from 2009 to 2013. Mr. Robinson joined the Company and was appointed Vice President and Chief Financial Officer in December 2015. Prior to joining the Company, Mr. Robinson was the Chief Financial Officer for Imation Corp., a global scalable storage and data security company, a position he held since August 2014. During his 11 years with Imation, he also served as the Investor Relations Officer, Corporate Controller and Chief Accounting Officer. Prior to that, he held positions at Deluxe Corporation and PricewaterhouseCoopers LLP. Mr. Scalf joined the Company in 1989 and has held various positions, including Director of Global Operations from 2003 to 2006; General Manager of Exhaust & Emissions from 2006 to 2008; General Manager of Industrial Filtration Solutions from 2008 to 2012; and Vice President of Global Industrial Air Filtration from 2012 to 2014. Mr. Scalf was appointed Senior Vice President, Engine Products in April 2014. Mr. Spethmann joined the Company in 2013 and has held various positions, including Vice President of the Exhaust & Emissions business unit from 2013 to 2014 and Vice President, Global Industrial Air Filtration from 2014 to 2016. Mr. Spethmann was appointed Senior Vice President of Industrial Products in April 2016. Prior to joining the Company, from 1999 to 2012, Mr.
Spethmann held positions of General Manager and President of Blow Molded Specialties, Inc., a manufacturing company focused on the extrusion of blow molded parts and assemblies. Mr. Vermeersch joined the Company in 1992 and has held various positions, including Director, Gas Turbine Systems, Asia Pacific from 2000 to 2005; Manager, Aftermarket and Service Industrial Filtration Solutions, Belgium from 2005 to 2006; Manager, Industrial Filtration Solutions, Belgium from 2006 to 2007; Director, Gas Turbine Systems, Europe, Middle East and North Africa from 2007 to 2010; and Director, Engine, Europe, Middle East and North Africa from 2010 to 2011. Mr. Vermeersch was appointed Vice President, Europe, Middle East and Africa in January 2012. The Company's common stock, par value $5.00 per share, is traded on the New York Stock Exchange under the symbol "DCI." To determine the appropriate level of dividend payouts, the Company considers recent and projected performance across key financial metrics, including earnings, cash flow from operations and total debt. As of September 20, 2017, there were 1,521 registered shareholders of common stock. The following table summarizes information in connection with purchases made by, or on behalf of, the Company or any affiliated purchaser of the Company, of shares of the Company’s common stock during the three months ended July 31, 2017. On May 29, 2015, the Board of Directors authorized the repurchase of up to 14.0 million shares of the Company's common stock. This repurchase authorization is effective until terminated by the Board of Directors. There were no repurchases of common stock made outside of the Company's current repurchase authorization during the three months ended July 31, 2017. However, the "Total Number of Shares Purchased" column of the table above includes 3,738 shares of previously owned shares tendered by option holders in payment of the exercise price of options during the quarter. While not considered repurchases of shares, the Company does at times withhold shares that would otherwise be issued under equity-based awards to cover the withholding of taxes due as a result of exercising stock options or payment of equity-based awards. The table set forth in Part III, Item 12, “Security Ownership of Certain Beneficial Owners and Management and Related Stockholder Matters” of this Annual Report is also incorporated herein by reference. 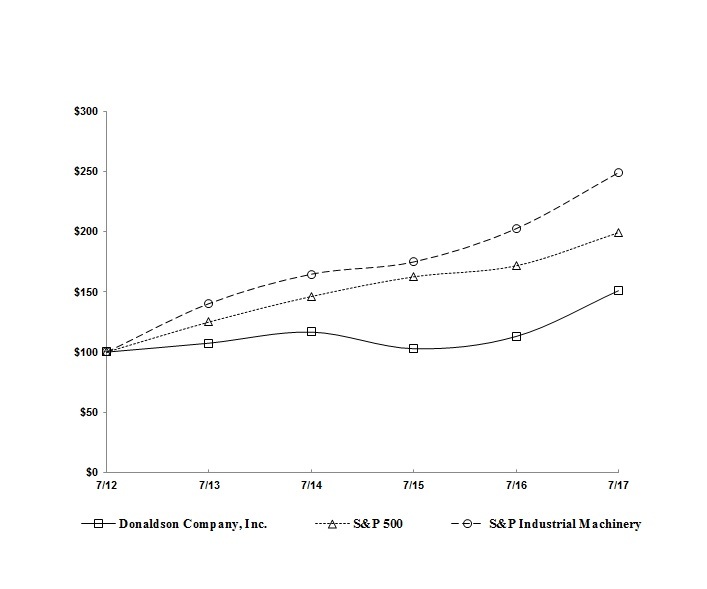 The graph below compares the cumulative total shareholder return on the Company’s common stock for the last five fiscal years with the cumulative total return of the Standard & Poor’s 500 Stock Index and the Standard & Poor’s Industrial Machinery Index. The graph and table assume the investment of $100 in each of the Company’s common stock and the specified indexes at the beginning of the applicable period and assume the reinvestment of all dividends. Effective fiscal 2017 the Company adopted Accounting Standards Update (ASU) 2015-03, which changes the presentation of debt issuance costs. Prior periods have been adjusted for this new accounting standard. The following Management’s Discussion and Analysis of Financial Condition and Results of Operations (MD&A) is intended to help the reader understand the Company's results of operations and financial condition for the three years ended July 31, 2017. The MD&A should be read in conjunction with the Company's Consolidated Financial Statements and Notes included in Item 8 of this Annual Report. This discussion contains forward-looking statements that involve risks and uncertainties. The Company’s actual results could differ materially from those anticipated in these forward-looking statements as a result of various factors, including those discussed elsewhere in this Annual Report, particularly Item 1A, "Risk Factors" and in the Safe Harbor Statement under the Securities Reform Act of 1995 below. Throughout this MD&A, the Company refers to measures used by management to evaluate performance, including a number of financial measures that are not defined under accounting principles generally accepted in the United States of America (GAAP). Excluding foreign currency translation from net sales and net earnings are not measures of financial performance under GAAP; however, the Company believes they are useful in understanding its financial results and provide comparable measures for understanding the operating results of the Company between different fiscal periods. Reconciliations within this MD&A provide more details on the use and derivation of these measures. Donaldson is a worldwide manufacturer of filtration systems and replacement parts. The Company’s core strengths are leading filtration technology, strong customer relationships and its global presence. The Company operates through two reporting segments, Engine Products and Industrial Products, and offers replacement parts and systems for a variety of product lines including air filtration and purification, liquid filtration for hydraulics, fuel and lube applications, and exhaust and emission. As a worldwide business, the Company’s results of operations are affected by conditions in the global economic environment. Under most economic conditions, the Company’s market diversification between its OEM and replacement parts customers, its diesel engine and industrial end markets and its global end markets has helped to limit the impact of weakness in any one product line, market or geography on the consolidated operating results of the Company. Net sales for the year ended July 31, 2017 were $2,371.9 million, as compared with $2,220.3 million for the year ended July 31, 2016, an increase of $151.6 million, or 6.8%. Net sales were negatively impacted by foreign currency translation, which decreased sales by $8.2 million. On a constant currency basis, net sales for the year ended July 31, 2017 increased 7.2% from the prior fiscal year. Net earnings for the year ended July 31, 2017 were $232.8 million, as compared with $190.8 million for the year ended July 31, 2016, an increase of $42.0 million, or 22.0%. Diluted earnings per share were $1.74 for the year ended July 31, 2017, as compared with $1.42 for the year ended July 31, 2016, an increase of 22.5%. The impact of foreign currency translation is calculated by translating current period foreign currency revenue into U.S. dollars using the average foreign currency exchange rates for the prior fiscal year period rather than actual current period foreign currency exchange rates. The fiscal 2017 sales increase of $151.6 million from fiscal 2016 was primarily driven by increases in the Aftermarket and Off-Road business units within the Engine Products segment, partially offset by declining sales of Gas Turbine Systems products and On-Road. Fiscal 2017 sales increased $162.0 million in the Engine Products segment and decreased $10.4 million in the Industrial Products segment. Foreign currency exchange rate fluctuations increased sales of Engine Products by $0.6 million and decreased Industrial Products sales by $8.8 million. Fiscal 2017 sales cadence reflected typical seasonality, with a larger percent of full-year revenue realized during the second half of the fiscal year. The Company continues to face a mixed operating environment, with engine-related end markets, including global agriculture, mining and construction, exhibiting signs of stability and recovery, whereas Industrial markets remain somewhat uncertain. At August 31, 2017, the backlog of orders expected to be delivered within 90 days was $395.5 million. The 90-day backlog at August 31, 2016, was $323.0 million. The backlog of orders expected to be delivered within 90 days increased 25.7% for the Engine Products segment and increased 5.7% for the Industrial Products segment. The increase is due to the continued strong demand across multiple product lines. Backlog is one of many indicators of business conditions in the Company’s markets. However, it is not always indicative of future results for a number of reasons, including short lead times in the Company’s replacement parts businesses and the timing of the receipt of orders in many of the Company’s engine OEM and industrial markets. The cost the Company paid for steel during fiscal 2017 varied by grade, but in aggregate, increased during the fiscal year. The steel cost increase was related to import restrictions placed on foreign-made steel and on a post-election run-up in steel in U.S. markets and on upward price pressure in other geographies around the world. The Company’s cost of filter media also varies by type and increased slightly year-over-year. The Company operates ongoing continuous improvement efforts, which partially offset increases in both steel and media. The cost of petroleum-based products was relatively flat year-over-year. The Company anticipates some continuing pressure on commodity prices in fiscal 2018, as compared with fiscal 2017, specifically for steel and filter media. On an ongoing basis, the Company enters into selective supply arrangements with certain of its suppliers that allow the Company to reduce volatility in its costs. The Company strives to recover or offset all material cost increases through selective price increases to its customers and the Company’s cost reduction initiatives, which include material substitution, process improvement and product redesigns. Gross margin for the year ended July 31, 2017 was 34.7%, or a 0.7 percentage point increase from 34.0% for the year ended July 31, 2016. The fiscal 2017 rate does not include restructuring charges, which negatively affected the prior year rate by approximately 0.3 percentage points. Additionally, the fiscal 2017 rate benefited from greater absorption of fixed costs on the year-over-year sales increase, partially offset by higher variable costs, including raw materials as well as freight charges, related to meeting higher-than-expected customer demand. which reduced gross margin in those fiscal years by approximately 0.3 percentage points and 0.4 percentage points, respectively. Compared with fiscal 2015, the fiscal 2016 gross margin reflects benefits from the Company’s cost-savings initiatives, including restructuring, that were offset by lower fixed cost absorption due to a decrease in sales in fiscal 2016 compared to fiscal 2015. Operating expenses for the year ended July 31, 2017 were $494.5 million, or 20.9% of net sales, as compared with $480.6 million, or 21.6% of net sales, for the year ended July 31, 2016. The decrease in operating expenses as a percentage of sales was primarily driven by the lack of restructuring charges in the current fiscal year combined with leverage gained on the year-over-year sales increase, partially offset by higher variable compensation expense than fiscal 2016. Operating expenses for the year ended July 31, 2016 were $480.6 million, or 21.6% of net sales, as compared with $520.3 million, or 21.9% of net sales, for the year ended July 31, 2015. The year-over-year decrease in operating expenses as a percentage of sales was primarily driven by expense savings from previous restructuring actions combined with the Company's efforts to control expenses. Interest expense for the year ended July 31, 2017 was $19.5 million, as compared with $20.7 million for the year ended July 31, 2016, a decrease of $1.2 million. The decrease is due to the average level of debt outstanding during fiscal 2017 being lower than fiscal 2016. Other income, net for the year ended July 31, 2017 was $12.9 million, as compared with $3.9 million for the year ended July 31, 2016. The increase in other income, net for fiscal 2017 was primarily due to a $6.8 million favorable settlement of claims in an escrow account associated with general representations and warranties that had been established in connection with the Company’s acquisition of Northern Technical. Interest expense for the year ended July 31, 2016 was $20.7 million, as compared with $15.2 million for the year ended July 31, 2015, an increase of $5.5 million. The increase was due to $150.0 million of debt issued in April 2015 that was outstanding for all of fiscal 2016. Other income, net for the year ended July 31, 2016 was $3.9 million, as compared with $15.5 million for the year ended July 31, 2015. The decrease in other income, net for fiscal 2016 was primarily driven by $6.8 million of higher losses on foreign exchange compared with fiscal 2015. The effective tax rate for the year ended July 31, 2017 was 27.7%, as compared with 25.9% for the year ended July 31, 2016. The year-over-year change was primarily driven by nonrecurring tax benefits recorded in fiscal 2016 from the favorable settlements of tax audits, which reduced the prior year effective tax rate by 1.7 percentage points. The effective tax rate for the year ended July 31, 2016 was 25.9%, as compared with 27.9% for the year ended July 31, 2015. The year-over-year change was primarily driven by nonrecurring tax benefits recorded in fiscal 2016 from the favorable settlements of tax audits and the mix of earnings between tax jurisdictions. Net earnings for the year ended July 31, 2016 were $190.8 million, as compared with $208.1 million for the year ended July 31, 2015, a decrease of $17.3 million, or 8.3%. Diluted net earnings per share were $1.42 for the year ended July 31, 2016, as compared with $1.49 for the year ended July 31, 2015, a decrease of 4.7%. The impact of foreign currency translation is calculated by translating current period foreign currency net earnings into U.S. dollars using the average foreign currency exchange rates for the prior fiscal year period rather than actual current period foreign currency exchange rates. The Company did not incur any restructuring or impairment charges during fiscal 2017. The Company incurred $16.1 million of restructuring changes in fiscal 2016 with $10.4 million recorded in operating expenses and the remaining $5.7 million recorded in cost of sales. The Engine Products segment incurred $8.8 million and the Industrial Products segment incurred $7.3 million of the restructuring charges for fiscal 2016. The Company incurred $16.9 million of restructuring and impairment charges in fiscal 2015 with $8.5 million recorded in operating expenses and the remaining $8.4 million recorded in cost of sales. The Engine Products segment incurred $9.2 million and the Industrial Products segment incurred $3.8 million of the restructuring and impairment charges for fiscal 2015. The charges for fiscal 2016 and fiscal 2015 consisted of one-time termination benefits from restructuring salaried and production workforce in all geographic regions and closing a production facility in Grinnell, Iowa. In addition, in fiscal 2015 the Company recorded the abandonment and write-off of a partially completed facility in Xuzhou, China and a $3.9 million charge related to a lump-sum settlement of its U.S. pension plan. As the Company’s restructuring actions were mainly incurred and paid in the same period, there was no material liability balance as of either of the periods presented. Corporate and Unallocated includes corporate expenses determined to be non-allocable to the segments, such as interest income and interest expense. The Corporate and Unallocated results were determined on a consistent basis for all periods presented. The Engine Products segment sells to OEMs in the construction, mining, agriculture, aerospace, defense and truck end markets, and to independent distributors, OEM dealer networks, private label accounts and large equipment fleets. Products include replacement filters for both air and liquid filtration applications, air filtration systems, liquid filtration systems for fuel, lube and hydraulic applications, and exhaust and emissions systems. Net sales for the Engine Products segment for the year ended July 31, 2017 were $1,553.3 million, as compared with $1,391.3 million for the year ended July 31, 2016, an increase of $162.0 million, or 11.6%. Sales in all product groups except On-Road increased from the prior year, with increased sales in Aftermarket and Off-Road driving nearly all of the segment-level improvement. The impact of foreign currency translation during fiscal 2017 increased Engine Products sales by $0.6 million. In constant currency, fiscal 2017 Engine Products sales increased $161.3 million, or 11.6%. Worldwide sales of Off-Road were $252.1 million, an increase of 16.4% from fiscal 2016. In constant currency, sales increased $37.2 million, or 17.2%. Sales in fiscal 2017 benefited from the Company’s success in winning new programs for air and liquid filtration systems with innovative products, combined with improving market conditions in the global mining, agriculture and construction industries. Worldwide sales of On-Road were $110.7 million, a decrease of 13.0% from fiscal 2016. In constant currency, sales decreased $17.2 million, or 13.5%. Decreasing production of heavy-duty trucks in all regions drove the year-over-year decline. Worldwide sales of Aftermarket were $1,086.2 million, an increase of 14.2% from fiscal 2016. In constant currency, sales increased $132.3 million, or 13.9%. The increase was primarily driven by strength in the Company’s innovative air and liquid filtration products combined with benefits from further geographic expansion of distribution and production of aftermarket products. Aftermarket sales also included a combined benefit of approximately $21.7 million from the acquisitions of Hy-Pro and Industrias Partmo, which were both completed during fiscal 2017. Worldwide sales of Aerospace and Defense were $104.3 million, an increase of 8.7% from fiscal 2016. In constant currency, sales increased $9.0 million, or 9.4%. The increase from fiscal 2016 was driven by sales growth of aerospace replacement parts and defense products for ground vehicles, partially offset by first-fit sales of aerospace products to rotary-wing aircraft that remained under pressure. Earnings before income taxes for the Engine Products segment for the year ended July 31, 2017 were $219.7 million, or 14.1% of Engine Products' sales, an increase from 11.8% of sales for the year ended July 31, 2016. Improved cost absorption on higher sales than the prior year drove the improvement, which was partially offset by incremental costs, such as freight charges, related to meeting higher-than-expected demand. Net sales for the Engine Products segment for the year ended July 31, 2016 were $1,391.3 million, as compared with $1,484.1 million for the year ended July 31, 2015, a decrease of $92.8 million, or 6.3%. The decrease was driven by declines in all product groups and the impact of foreign currency translation. The impact of foreign currency translation during fiscal 2016 decreased Engine Products sales by $43.4 million, or 2.9%. In constant currency, fiscal 2016 Engine Products sales decreased $49.4 million, or 3.3%. Worldwide sales of Off-Road were $216.6 million, a decrease of 17.0% from fiscal 2015. In constant currency, sales decreased $37.3 million, or 14.3%. These decreases were driven by a continued weakness in the global agricultural, mining and construction equipment markets with decreased build rates in all regions and the negative impacts of foreign currency translation. Worldwide sales of On-Road were $127.2 million, a decrease of 8.1% from fiscal 2015. In constant currency, sales decreased $8.5 million, or 6.1%. Growth in Asia Pacific and continued strength of medium-duty production was not enough to offset the revenue decreases associated with the slowing production of Class 8 trucks in North America, resulting in a steep decline in this business. Worldwide sales of Aftermarket were $951.5 million, a decrease of 3.0% from fiscal 2015. In constant currency, sales increased $2.7 million, or 0.3%. The primary driver of the sales decrease from fiscal 2015 was foreign currency translation with sales in local currency remaining relatively flat compared with prior year. Worldwide sales of Aerospace and Defense were $96.0 million, a decrease of 7.6% from fiscal 2015. In constant currency, sales decreased $6.3 million, or 6.1%. These decreases were due to Aerospace commercial slow down while Defense ground vehicle remained relatively flat. The decline in commercial aerospace was primarily in rotary-wing aircraft reflecting a slowdown in oil exploration that resulted in fewer flight hours. Many Defense platforms were delayed due to funding. Earnings before income taxes for the Engine Products segment for the year ended July 31, 2016 were $163.5 million, or 11.8% of Engine Products' sales, a decrease from 12.6% of sales for the year ended July 31, 2015. The percentage earnings decrease was driven by lower cost absorption due to a decrease in production volumes and the impact of foreign currency translation. The Industrial Products segment sells to various dealers, distributors, OEMs of gas-fired turbines and OEMs and end users requiring clean air filtration solutions and replacement filters. Products include dust, fume and mist collectors, compressed air purification systems, air filtration systems for gas turbines, PTFE membrane-based products and specialized air and gas filtration systems for applications including hard disk drives and semi-conductor manufacturing. Net sales for the Industrial Products segment for the year ended July 31, 2017 were $818.6 million, as compared with $829.0 million for the year ended July 31, 2016, a decrease of $10.4 million, or 1.2%. This decrease was driven by a 17.9% decrease in Gas Turbine Systems sales and the impact of foreign currency translation, partially offset by year-over-year sales increases for Industrial Filtration Solutions and Special Applications. The impact of foreign currency translation during fiscal 2017 decreased Industrial Products sales by $8.8 million, or 1.0%. In constant currency, fiscal 2017 Industrial Products sales decreased $1.5 million, or 0.2%. Worldwide sales of Industrial Filtration Solutions were $533.2 million, a 3.0% increase from fiscal 2016. In constant currency, sales increased $20.7 million, or 4.0%. Sales of replacement parts drove the increase, partially offset by reduced sales of new equipment as the market pressures related to global capital expenditures and investments continued to pressure the business. Worldwide sales of Gas Turbine Systems were $122.9 million, a 17.9% decrease from fiscal 2016. In constant currency, sales declined $25.6 million, or 17.1%. The sales decline was primarily driven by market-related pressures, including the Company’s decision to be more selective in bidding large turbine projects. Gas Turbine Systems sales are typically large systems and, as a result, the Company's shipments and revenues fluctuate from period to period. Worldwide sales of Special Applications were $162.5 million, a 0.6% increase from fiscal 2016. In constant currency, sales increased $3.4 million, or 2.1%. The increase was driven primarily by sales of venting solutions and products for semiconductor applications. Although the hard disk drive market remains in secular decline, temporarily favorable market conditions during fiscal 2017 combined with the Company’s efforts to increase content per drive resulted in sales of disk drive filters that were slightly higher than the prior year. Earnings before income taxes for the Industrial Products segment for the year ended July 31, 2017 were $129.1 million, or 15.8% of Industrial Products' sales, an increase from 14.4% of sales for the year ended July 31, 2016. The earnings before income taxes percentage increase was driven by the benefit from the escrow settlement of $6.8 million related to the Northern Technical acquisition combined with the lack of restructuring charges in fiscal 2017 versus the prior year, during which $7.3 million were recorded. Net sales for the Industrial Products segment for the year ended July 31, 2016 were $829.0 million, as compared with $887.1 million for the year ended July 31, 2015, a decrease of $58.1 million, or 6.5%. This decrease was driven by a 20.0% decrease in Gas Turbine Systems sales and the impact of foreign currency translation. The impact of foreign currency translation during fiscal 2016 decreased Industrial Products sales by $30.8 million, or 3.5%. In constant currency, fiscal 2016 Industrial Products sales decreased $27.3 million, or 3.1%. Worldwide sales of Industrial Filtration Solutions were $517.9 million, a 2.1% decrease from fiscal 2015. In constant currency, fiscal 2016 sales increased $7.7 million, or 1.5%. Sales of both aftermarket and equipment were consistent with fiscal 2015. Worldwide sales of Gas Turbine Systems were $149.6 million, a 20.0% decrease from fiscal 2015. In constant currency, fiscal 2016 sales decreased $33.9 million, or 18.1%. Gas Turbine Systems sales are typically large systems and, as a result, the Company's shipments and revenues fluctuate from period to period. Worldwide sales of Special Applications were $161.5 million, a 5.7% decrease from fiscal 2015. In constant currency, fiscal 2016 sales decreased $1.1 million, or 0.6%. These decreases were driven by weakness in disk drive product sales as the business is in a secular decline as solid-state memory replaces traditional hard disk drives. Earnings before income taxes for the Industrial Products segment for the year ended July 31, 2016 were $119.0 million, or 14.4% of Industrial Products' sales, an increase from 13.9% of sales for the year ended July 31, 2015. The fiscal 2016 earnings before income taxes percentage increase was driven by the benefits from previous restructuring actions and favorable product mix partially offset by a $3.5 million increase in restructuring charges. As of July 31, 2017, long-term debt represented 38.6% of total long-term capital, defined as long-term debt plus total shareholders’ equity, compared with 31.2% at July 31, 2016. Total long-term debt outstanding at July 31, 2017 was $537.3 million compared with $350.2 million at the prior year end, an increase of $187.1 million, primarily due to the refinancing of debt outstanding under the revolving credit facility into long-term debt in connection with the amendment and restatement of the related credit agreement. as discussed in Note 16 in the Notes to Consolidated Financial Statements included in Item 8 of this Annual Report, as issued standby letters of credit reduce the amounts available for borrowing under this facility. The credit facility also includes a $50.0 million term loan due July 21, 2020. Borrowings under the Company's amended revolving credit facility are automatically rolled over until the credit facility maturity date unless the agreement is terminated early or the Company is found to be in default. Therefore, beginning on July 21, 2017 (at which time $270.0 million was outstanding) and subsequent to that date, all borrowings under this credit facility are classified as long-term debt on the Company’s Consolidated Balance Sheets. On July 22, 2016, a Japanese subsidiary of the Company issued a ¥1.0 billion note that was guaranteed by the Company. The debt was issued at face value of ¥1.0 billion (approximately $9.0 million at July 31, 2017), is due July 15, 2021, and bears interest payable quarterly at a variable interest rate. The interest rate was 0.25% as of July 31, 2017 and 2016. The Company has two uncommitted credit facilities in the U.S., which provide unsecured borrowings for general corporate purposes. There was $19.2 million outstanding at July 31, 2017 and $26.8 million outstanding at July 31, 2016, and all borrowings that were outstanding on those dates had maturities that were less than twelve months. The weighted average interest rate on the short-term borrowings outstanding at July 31, 2017 and 2016 was 2.00% and 1.25%, respectively. At July 31, 2017 and 2016, there was $45.7 million and $38.2 million, respectively, available under these two credit facilities. The Company has a €100.0 million (approximately $117.3 million at July 31, 2017) program for issuing treasury notes for raising short-, medium- and long-term financing for its European operations. There were no amounts outstanding under this program at July 31, 2017 or 2016. Additionally, the Company’s European operations have lines of credit with an available limit of €43.5 million (approximately $51.0 million at July 31, 2017). There was no amount outstanding at July 31, 2017 or 2016. Other international subsidiaries may borrow under various credit facilities. There was approximately $4.1 million outstanding under these credit facilities as of July 31, 2017 and $8.7 million as of July 31, 2016. All borrowings that were outstanding on those dates had maturities that were less than twelve months. At July 31, 2017 and 2016, there was approximately $39.8 million and $45.5 million available for use, respectively, under these facilities. The weighted average interest rate on these short-term borrowings outstanding at July 31, 2017 and 2016 was 0.32%. At July 31, 2017 and 2016, the Company had a contingent liability for standby letters of credit totaling $10.5 million and $7.3 million, respectively, that have been issued and are outstanding. The letters of credit guarantee payment to third parties in the event the Company is in breach of insurance contract terms as detailed in each letter of credit. At July 31, 2017 and 2016, there were no amounts drawn upon these letters of credit. Certain debt agreements, including the $500.0 million revolving credit facility, contain financial covenants related to interest coverage and leverage ratios, as well as other non-financial covenants. As of July 31, 2017, the Company was in compliance with all such covenants. The Company assesses its liquidity in terms of its ability to generate cash to fund its operating, investing and financing activities. Significant factors affecting liquidity are: cash flows generated from operating activities, capital expenditures, acquisitions, dispositions, dividends, repurchase of outstanding shares, adequacy of available bank lines of credit and the ability to attract long-term capital with satisfactory terms. The Company generates substantial cash from the operation of its businesses and remains in a strong financial position, with sufficient liquidity available for reinvestment in existing businesses and strategic acquisitions. Cash provided by operating activities for the year ended July 31, 2017 was $310.3 million, as compared with $286.1 million for the year ended July 31, 2016, an increase of $24.2 million. The increase in cash generated by operating activities resulted from higher net earnings of $42.0 million, partially offset by several changes in working capital items that resulted in a net cash reduction. Accounts receivable at July 31, 2017 was $497.7 million, as compared with $452.4 million at July 31, 2016, an increase of $45.3 million. The increase is due to increased sales in the fourth quarter of fiscal 2017, slightly offset by an improvement in days sales outstanding. Days sales outstanding was 67.2 days as of July 31, 2017, compared with 67.5 days as of July 31, 2016. The Company’s days sales outstanding is impacted by the mix of foreign sales, particularly in countries where longer payment terms are customary. Days sales outstanding is calculated using the count back method, which calculates the number of days of most recent revenue that is reflected in the net accounts receivable balance. Inventories at July 31, 2017 was $293.5 million, as compared with $234.1 million at July 31, 2016, an increase of $59.4 million. The increase is primarily driven by increases across the regions to meet customer demand given the current sales momentum. Inventory turns were 4.5 times per year as of both July 31, 2017 and July 31, 2016. Inventory turns are calculated by taking the inventoriable portion of cost of goods sold for the trailing twelve month period divided by the average gross inventory value over the prior thirteen month period. Cash provided by operating activities for the year ended July 31, 2016 was $286.1 million, as compared with $212.8 million for the year ended July 31, 2015, an increase of $73.3 million. The increase in cash generated from operating activities resulted from a $99.6 million higher cash inflow from working capital relative to fiscal 2015, partially offset by lower net earnings of $17.3 million. The higher cash outflow from working capital was primarily attributable to improvements in inventories and accounts receivable of $55.3 million and $29.2 million, respectively, compared to fiscal 2015 driven by active working capital management. Cash used in investing activities for the year ended July 31, 2017 was $95.7 million, as compared with $55.6 million for the year ended July 31, 2016, an increase of $40.1 million. The increase in cash used in investing activities between the periods resulted from a decrease in proceeds from sales of short-term investments of $28.0 million and an increase in cash outflows for acquisitions of $19.3 million as the Company acquired Partmo, a leading manufacturer of replacement air, lube and fuel filters in Colombia for medium and heavy duty engines, and Hy-Pro, a domestic manufacturer of filtration systems and replacement filters for stationary hydraulic and industrial lubrication applications. The increase in cash utilized was partially offset by a decrease in capital expenditures of $7.0 million. Cash used in investing activities for the year ended July 31, 2016 was $55.6 million, as compared with $111.7 million for the year ended July 31, 2015, a decrease of $56.1 million. The decrease in cash used in investing activities between the periods resulted from a decrease in cash outflows for acquisitions and capital expenditures of $92.7 million and $20.9 million, respectively, partially offset by a decrease in net proceeds from sales of short-term investments of $59.5 million. Cash flows used in financing activities generally relate to the use of cash for repurchases of the Company's common stock and payment of dividends, net borrowing activity and proceeds from the exercise of stock options. The Company's Board of Directors authorized the repurchase of up to 14.0 million shares of common stock under the Company’s stock repurchase plan dated May 29, 2015. This repurchase authorization is effective until terminated by the Board of Directors. As of July 31, 2017, the Company had remaining authorization to repurchase 7.2 million shares under this plan. To determine the appropriate level of dividend payouts, the Company considers recent and projected performance across key financial metrics, including earnings, cash flow from operations and total debt. Dividends paid for years ended July 31, 2017, 2016 and 2015 were $92.4 million, $91.2 million and $91.2 million, respectively. Cash used in financing activities for the year ended July 31, 2017 was $157.7 million, as compared with $175.0 million for the year ended July 31, 2016, a decrease of $17.3 million. The decrease was driven by increased short-term borrowings and long-term debt, including current maturities for the year ended July 31, 2017 compared with the prior year of $62.9 million, partially offset by higher share repurchases for the year ended July 31, 2017 compared with the prior year of $56.1 million. Cash used in financing activities for the year ended July 31, 2016 was $175.0 million, as compared with $179.0 million for the year ended July 31, 2015, a decrease of $4.0 million. The decrease resulted from lower share repurchases for the year ended July 31, 2016 compared with the prior year of $172.0 million, partially offset by lower net proceeds from short-term borrowings and long-term debt for the year ended July 31, 2016 compared with the prior year of $164.0 million. At July 31, 2017 and 2016, cash and cash equivalents were $308.4 million and $243.2 million, respectively. The majority of the Company’s cash and cash equivalents are held by its foreign subsidiaries as over half of the Company’s earnings occur outside the U.S. Most of these funds are considered permanently reinvested outside the U.S., as the cash generated from U.S. operations plus the Company’s debt facilities are anticipated to be sufficient for the Company's U.S. operation’s cash needs. If additional cash was required for the Company’s operations in the U.S., it may be subject to additional U.S. taxes if funds were repatriated from certain foreign subsidiaries. At July 31, 2017, the Company had $553.3 million available under existing credit facilities. The Company believes that the combination of existing cash, available credit under existing credit facilities and the expected cash generated by operating activities will be adequate to meet cash requirements for fiscal 2018, including debt repayments, payment of anticipated dividends, possible share repurchase activity, potential acquisitions and capital expenditures. The Company does not have any off-balance sheet arrangements, with the exception of the guarantee of 50% of certain debt of its joint venture with Caterpillar Inc., Advanced Filtration Systems Inc. (AFSI). As of July 31, 2017, the joint venture had $27.8 million of outstanding debt, of which the Company guarantees half. The Company does not believe that this guarantee will have a current or future effect on its financial condition, results of operations, liquidity or capital resources. Purchase obligations consist primarily of inventory, tooling and capital expenditures. The Company’s purchase orders for inventory are based on expected customer demand and, as a result, quantities and dollar volumes are subject to change. Pension and deferred compensation consists of long-term pension liabilities and salary and bonus deferrals elected by certain executives under the Company’s deferred compensation plan. Deferred compensation balances earn interest based on a treasury bond rate as defined by the plan (10-year treasury bond STRIP rate plus two percent for deferrals prior to January 1, 2011 and 10-year treasury bond rates for deferrals after December 31, 2010), are approved by the Human Resources Committee of the Board of Directors and are payable at the election of the participants. In addition to the above contractual obligations, the Company may be obligated for additional cash outflows of $21.1 million for potential tax obligations, including accrued interest and penalties. The payment and timing of any such payments is affected by the ultimate resolution of the tax years that are under audit or remain subject to examination by the relevant taxing authorities. Therefore, quantification of an estimated range and timing of future payments cannot be made at this time. Revenue recognition The Company sells a wide range of filtration solutions into many industries around the globe. Revenue is recognized when both product ownership and the risk of loss have transferred to the customer, the Company has no remaining obligations, the selling price is fixed and determinable and collectability is reasonably assured. The vast majority of the Company’s sales contracts are for standard products with product ownership and risk of loss transferring to the customer when the product has shipped, at which point revenue is recognized. Although less common, the Company does have sales contracts with customers requiring product ownership and risk of loss to transfer at the customer’s location. For these non-standard terms, the Company defers revenue on these product sales until the product has been delivered. components and when all terms specified in the contract are met, which may include requirements such as the Company delivering technical documentation to the customer or a quality inspection approved by the customer. In limited circumstances, the Company enters into sales contracts that involve multiple elements (such as equipment, replacement filter elements and installation services). In these instances, the Company determines if the multiple elements in the arrangement represent separate units of accounting. If separate units of accounting exist, the price of the entire arrangement is allocated to the separate units of account using the Company’s best estimate of relative selling price if the unit of account was sold separately. Revenue is then recognized separately for each unit of account when the criteria for revenue recognition have been met. Additionally, the Company records estimated discounts and rebates offered to customers as a reduction of sales in the same period revenue is recognized. Goodwill Goodwill is assessed for impairment annually or more frequently if an event occurs or circumstances change that would indicate the asset may be impaired. The impairment assessment for goodwill is done at a reporting unit level, which is one level below the operating segment level. An impairment loss would be recognized when the carrying amount of the reporting unit’s net assets exceeds the estimated fair value of the reporting unit. The fair values are determined using an income approach, a market approach or a weighting of the two. Significant estimates and assumptions are utilized in the valuations, including prices investors paid for the stocks of comparable, publicly traded companies and discounted, projected cash flows. The Company performed its annual impairment assessment during the third quarter of fiscal 2017. The results of this assessment were that the estimated fair values of the reporting units to which goodwill is assigned continued to exceed the corresponding carrying values of the reporting units, resulting in no goodwill impairment. Of the Company's five reporting units that contain goodwill, the estimated fair values exceeded the respective carrying values by at least 60% for all but the Gas Turbine Systems reporting unit, for which the estimated fair value exceeded the carrying amount by approximately 15%. Goodwill associated with the Gas Turbine Systems reporting unit was $60.4 million as of the annual impairment assessment and is included in the Industrial Products segment. The Company completed its Gas Turbine Systems goodwill impairment assessment using a weighting of the fair values as determined under a market approach and an income approach to determine the estimated fair value of the reporting unit. The public company method of the market approach estimated fair value based on prices investors paid for the stocks of comparable, publicly traded companies. The income approach estimated fair value based on discounted, projected cash flows from the reporting unit's financial forecast. A terminal growth rate of 3.0% was used, as well as a discount rate of 11.5% reflecting the relative risk of achieving cash flows and any other specific risks or factors related to the Gas Turbine Systems reporting unit. The Company believes the assumptions used in its discounted cash flow analysis are appropriate and result in a reasonable estimate of the reporting unit's fair value. The Company performed a sensitivity analysis to determine how the assumptions impact the results of the impairment assessment under this valuation approach. Holding all other assumptions constant, zero revenue growth or below for fiscal years 2019-2026 would result in impairment. Additionally, a decrease in the terminal growth rate of 3.0% to zero or below, or an increase in the discount rate by 1.5% or more, would result in impairment. While these projections supported no impairment of goodwill of this reporting unit, given the sensitivities to the assumptions used in the calculations of the projected cash flows, it is possible that impairment could be incurred in the future. The Company will continue to monitor results and projected cash flows to assess whether goodwill impairment in the Gas Turbine Systems reporting unit may be necessary. Income taxes Management is required to estimate income taxes in each of the jurisdictions in which the Company operates. This process involves estimating actual current tax exposure and assessing future tax consequences attributable to temporary differences between the financial statement carrying amount of existing assets and liabilities and their respective tax basis. These deferred tax assets and liabilities are measured using the enacted tax rates expected to apply to taxable income in the years in which those temporary differences are anticipated to reverse based on future taxable income projections and the impact of tax planning strategies. The Company intends to indefinitely reinvest undistributed earnings of its non-U.S. subsidiaries and thus has not provided for U.S. income taxes on these earnings. Additionally, benefits of tax return positions are recognized in the financial statements when the position is “more-likely-than-not” to be sustained by the taxing authorities based solely on the technical merits of the position. If the recognition threshold is met, the tax benefit is measured and recognized as the largest amount of tax benefit that in the Company's judgment is greater than 50% likely to be realized. The Company maintains a reserve for uncertain tax benefits that are currently unresolved and routinely monitors the potential impact of such situations. The liability for unrecognized tax benefits, accrued interest and penalties was $21.1 million and $17.5 million as of July 31, 2017 and 2016, respectively. Defined benefit pension plans The Company incurs expenses for employee benefits provided through defined benefit pension plans. In accounting for these defined benefit pension plans, management must make a variety of estimates and assumptions including mortality rates, discount rates, overall Company compensation increases and expected return on plan assets. The Company considers historical data as well as current facts and circumstances and uses a third-party specialist to assist management in determining these estimates. To develop the assumption for the expected long-term rate of return on assets for its U.S. pension plans, the Company considered historical returns and future expected returns for each asset class, as well as the target asset allocation of the pension portfolio. The expected return on plan assets assumption for the plans outside the U.S. reflects the investment allocation and expected total portfolio returns specific to each plan and country. The Company utilized a 6.58% and 6.90% asset-based weighted average expected return on plan assets for its U.S. plans for the years ended July 31, 2017 and 2016, respectively. The Company utilized a 4.19% and 3.93% asset-based weighted average expected return on plan assets for its non-U.S. plans for the years ended July 31, 2017 and 2016, respectively. The expected returns on plan assets are used to develop the following years' expense for the plans. The Company’s objective in selecting a discount rate for its pension plans is to select the best estimate of the rate at which the benefit obligations could be effectively settled on the measurement date, taking into account the nature and duration of the benefit obligations of the plan. In making this best estimate, the Company looks at the rates of return on high-quality, fixed-income investments currently available, and expected to be available, during the period to maturity of the benefits. This process includes assessing the universe of bonds available on the measurement date with a quality rating of Aa or better. Similar appropriate benchmarks are used to determine the discount rate for the non-U.S. plans. The Company utilized a 3.94% and 3.65% weighted average discount rate for its U.S. plans for the years ended July 31, 2017 and 2016, respectively. The Company utilized a 2.40% and 2.08% weighted average discount rate for its non-U.S. plans for the years ended July 31, 2017 and 2016, respectively. Beginning with its July 31, 2016 measurement date, the Company changed the method used to estimate the service and interest costs for pension benefits. The new method utilizes a full yield curve approach to estimate service and interest costs by applying specific spot rates along the yield curve used to determine the benefit obligation of relevant projected cash outflows. Historically, the Company had utilized a single weighted average discount rate applied to projected cash outflows. The Company made the change to provide a more precise measurement of service and interest costs by aligning the timing of the plans' liability cash flows to the corresponding spot rate on the yield curve. The change does not impact the measurement of the plans' obligations and did not have a material impact on the Company's pension expense beginning in fiscal 2017. The Company has accounted for this change as a change in accounting estimate. The Company’s net periodic benefit cost recognized in the Consolidated Statements of Earnings was $3.3 million, $17.8 million and $21.6 million for the years ended July 31, 2017, 2016 and 2015, respectively. While changes to the Company’s pension plan assumptions would not be expected to impact its net periodic benefit cost by a material amount, such changes could significantly impact the Company’s projected benefit obligation. For new accounting standards not yet adopted, refer to Note 1 in the Notes to Consolidated Financial Statements included in Item 8 of this Annual Report. The Company, through its management, may make forward-looking statements reflecting the Company’s current views with respect to future events and financial performance. These forward-looking statements, which may be included in reports filed under the Securities Exchange Act of 1934, as amended (the Exchange Act), in press releases and in other documents and materials as well as in written or oral statements made by or on behalf of the Company, are subject to certain risks and uncertainties, including those discussed in Part I, Item 1A, "Risk Factors" of this Annual Report, which could cause actual results to differ materially from historical results or those anticipated. The words or phrases “will likely result,” “are expected to,” “will continue,” “will allow,” “estimate,” “project,” “believe,” “expect,” “anticipate,” “forecast” and similar expressions are intended to identify forward-looking statements within the meaning of Section 21e of the Exchange Act and Section 27A of the Securities Act of 1933, as amended, as enacted by the Private Securities Litigation Reform Act of 1995 (PSLRA). In particular, the Company desires to take advantage of the protections of the PSLRA in connection with the forward-looking statements made in this Annual Report. All statements other than statements of historical fact are forward-looking statements. These statements do not guarantee future performance. Readers are cautioned not to place undue reliance on these forward-looking statements, which speak only as of the date such statements are made. In addition, the Company wishes to advise readers that the factors listed in Part I, Item 1A, "Risk Factors" of this Annual Report, as well as other factors, could affect the Company’s performance and could cause the Company’s actual results for future periods to differ materially from any opinions or statements expressed. These factors include, but are not limited to, world economic and industrial market conditions; the Company's ability to maintain certain competitive advantages over competitors; pricing pressures; the Company's ability to protect and enforce its intellectual property rights; the Company's dependence on global operations; customer concentration in certain cyclical industries; commodity availability and pricing; the Company's ability to develop new information technology systems and maintain and upgrade existing systems; information security and data breaches; foreign currency fluctuations; governmental laws and regulations; changes in tax laws, regulations and results of examinations; the Company's ability to attract and retain key personnel; changes in capital and credit markets; execution of the Company's acquisition strategy; the possibility of asset impairment; execution of restructuring plans; the Company's ability to maintain an effective system of internal control over financial reporting and other factors included in Part I, Item 1A, "Risk Factors"
of this Annual Report. The Company undertakes no obligation to publicly update or revise any forward-looking statements, whether as a result of new information, future events or otherwise, unless required by law. The Company’s market risk includes the potential loss arising from adverse changes in foreign currency exchange rates, interest rates, pension assumptions and commodity prices. See further discussion of these market risks below. Foreign currency The Company manages foreign currency market risk from time to time through the use of a variety of financial and derivative instruments. The Company does not enter into any of these instruments for speculative trading purposes. Rather, the Company’s objective in managing these risks is to reduce fluctuations in earnings and cash flows associated with changes in foreign currency exchange rates. The Company uses forward exchange contracts and other hedging activities to hedge the U.S. dollar value resulting from existing recognized foreign currency denominated asset and liability balances and also for anticipated foreign currency transactions. The Company also naturally hedges foreign currency through its production in the countries in which it sells its products. During fiscal 2017, the U.S. dollar was generally stronger than in fiscal 2016 compared with many of the currencies of the foreign countries in which the Company operates. The overall strength of the dollar had a negative impact on the Company’s international net sales results because the foreign denominated revenues translated into fewer U.S. dollars. It is not possible to determine the exact impact of foreign currency translation changes. However, the direct effect on reported net sales and net earnings can be estimated. For the year ended July 31, 2017, the estimated impact of foreign currency translation resulted in an overall decrease in reported net sales of $8.2 million and a decrease in reported net earnings of approximately $1.3 million. Foreign currency translation had a negative impact in many regions around the world. The Company maintains significant assets and operations in Europe, Asia Pacific, Latin America and South Africa, resulting in exposure to foreign currency gains and losses. A portion of the Company’s foreign currency exposure is naturally hedged by incurring liabilities, including bank debt, denominated in the local currency in which the Company’s foreign subsidiaries are located. The foreign subsidiaries of the Company generally purchase the majority of their input costs and then sell to many of their customers in the same local currency. However, the Company still may be exposed to cost increases relative to local currencies in the markets to which it sells. To mitigate such adverse trends, the Company, from time to time, enters into forward exchange contracts and other hedging activities. Additionally, foreign currency positions are partially offsetting and are netted against one another to reduce exposure. Some products made by the Company in the U.S. are sold internationally. As a result, sales of such products are affected by the value of the U.S. dollar relative to other currencies. Any long-term strengthening of the U.S. dollar could depress these sales. Also, competitive conditions in the Company’s markets may limit its ability to increase product pricing in the face of adverse currency movements. Interest The Company’s exposure to market risk for changes in interest rates relates primarily to debt obligations that are at variables rates, as well as the potential increase in fair value of long-term debt resulting from a potential decrease in interest rates. As of July 31, 2017, the Company’s financial liabilities with exposure to changes in interest rates consisted mainly of $240.0 million outstanding on the Company's revolving credit facility and term loan, ¥2.65 billion, or $24.0 million, of variable rate long-term debt and $23.3 million of short-term debt outstanding. Assuming a hypothetical increase of one-half percent in short-term interest rates, with all other variables remaining constant, interest expense would have increased $1.1 million and interest income would have increased $1.5 million in fiscal 2017. Interest rate changes would also affect the fair market value of the debt. As of July 31, 2017, the estimated fair value of long-term debt with fixed interest rates was $330.6 million compared to its carrying value of $325.0 million. The fair value is estimated by discounting the projected cash flows using the rate that similar amounts of debt could currently be borrowed. Pensions The Company is exposed to market return fluctuations on its qualified defined benefit pension plans. In fiscal 2017, the Company reduced its long-term rate of return from 6.90% to 6.58% on its U.S. plans and increased its rate from 3.93% to 4.19% on its non-U.S. plans, to reflect its future expectation for returns. Consistent with published bond indices, the Company increased its discount rate from 3.65% to 3.94% on its U.S. plans and increased its rates from 2.08% to 2.40% for its non-U.S. plans. The plans were underfunded by $50.0 million at July 31, 2017, since the projected benefit obligation exceeded the fair value of the plan assets. customers and the Company’s cost reduction initiatives, which include material substitution, process improvement and product redesigns. However, an increase in commodity prices could result in lower operating margins. Management is responsible for establishing and maintaining adequate internal control over financial reporting, as such term is defined in Exchange Act Rule 13a-15(f). Management of the Company has assessed the effectiveness of the Company’s internal control over financial reporting as of July 31, 2017. In making its assessment of internal control financial reporting, management used the criteria described in Internal Control - Integrated Framework - version 2013 issued by the Committee of Sponsoring Organizations of the Treadway Commission (COSO). Based on this evaluation, management concluded that the Company’s internal control over financial reporting was effective as of July 31, 2017 based on criteria in Internal Control-Integrated Framework issued by the COSO. The Company’s independent registered public accounting firm, PricewaterhouseCoopers LLP, has audited the effectiveness of the Company’s internal control over financial reporting as of July 31, 2017, as stated in its report, which appears herein. To the Shareholders and Board of Directors of Donaldson Company, Inc. In our opinion, the accompanying consolidated balance sheets and the related consolidated statements of earnings, comprehensive income, changes in shareholders’ equity and cash flows present fairly, in all material respects, the financial position of Donaldson Company, Inc. and its subsidiaries as of July 31, 2017 and 2016, and the results of their operations and their cash flows for each of the three years in the period ended July 31, 2017 in conformity with accounting principles generally accepted in the United States of America. Also in our opinion, the Company maintained, in all material respects, effective internal control over financial reporting as of July 31, 2017, based on criteria established in Internal Control - Integrated Framework (2013) issued by the Committee of Sponsoring Organizations of the Treadway Commission (COSO). The Company's management is responsible for these financial statements, for maintaining effective internal control over financial reporting and for its assessment of the effectiveness of internal control over financial reporting included in Management’s Report on Internal Control over Financial Reporting appearing under Item 8. Our responsibility is to express opinions on these financial statements and on the Company's internal control over financial reporting based on our integrated audits. We conducted our audits in accordance with the standards of the Public Company Accounting Oversight Board (United States). Those standards require that we plan and perform the audits to obtain reasonable assurance about whether the financial statements are free of material misstatement and whether effective internal control over financial reporting was maintained in all material respects. Our audits of the financial statements included examining, on a test basis, evidence supporting the amounts and disclosures in the financial statements, assessing the accounting principles used and significant estimates made by management, and evaluating the overall financial statement presentation. Our audit of internal control over financial reporting included obtaining an understanding of internal control over financial reporting, assessing the risk that a material weakness exists, and testing and evaluating the design and operating effectiveness of internal control based on the assessed risk. Our audits also included performing such other procedures as we considered necessary in the circumstances. We believe that our audits provide a reasonable basis for our opinions. As discussed in Note 1 to the consolidated financial statements, the Company changed the manner in which it classifies deferred income taxes on its consolidated balance sheet in 2017.